Barcelona, 16 December 2015 - Werner Vogels, Vice President and Chief Technology Officer atAmazon; Bracken Darrell, CEO of Logitech; Andrew Bolwell, Director of Innovation at Hewlett Packard; and Amir Faintuch, Senior Vice President and General Manager of the Platform Engineer Group at Intel, have been added to the line-up of speakers to appear at 4 Years From Now (4YFN) 2016. The third edition of the forum, backed by Mobile World Capital Barcelona in collaboration with the GSMA Mobile World Congress, will also feature the presence of Nicola Mendelsohn, Vice-president for EMEA at Facebook, and Catalonia’s Israel Ruiz, Executive Vice President and Treasurer at the Massachusetts Institute of Technology (MIT). Also worthy of note is the participation of Guy Horowitz, General Partner at DT Capital Partners; Ken Auletta, writer and critic for The New Yorker; Mike Butcher, editor-at-large at TechCrunch; and Marc Sommer, Senior Vice President of Business Development at Deutsche Telekom. The 4YFN programme will also include Jimmy Wales, cofounder of Wikipedia and Executive Director of the social network TPO; along with, for the second straight year, Jimmy Maymann, CEO of The Huffington Post. Yossi Vardi, the renowned Israeli investor, will again play a prominent role, serving as 4YFN’s honorary president. One of the main focuses at 4YFN 2016 will be the launch of the 4YFN Investors Club, a community of investors aimed at promoting business opportunities in the digital industry. This club’s first meeting will take place at 4YFN 2016, bringing together investors with agents from the entrepreneurial community, both Spanish and international, who for more than two years have participated in one or more initiatives promoted by 4YFN. 4YFN 2016 will also be bolstering the Founders & Investors forums, which will boast an expanded presence at the congress. These are rounds of meetings employing a “speed dating” format – this year benefitting from a more precise system, with the startups being classified by type and funding level required – and micro-stages with open mikes, similar to a “speaker’s corner,” making it possible to present projects to the general public. The journalists attending 4YFN 2016 will have their own space to interact with entrepreneurs and startups: Pitch the Press will consist of meetings between journalists and entrepreneurs, following a format similar to that used for the Founders & Investors sessions, as entrepreneurs will make quick pitches, lasting just 4 minutes, to individual journalists. This initiative has two aims. First, to amass as many relevant stories and projects as possible so that each journalist can access and absorb the most information. Secondly, to present as many startups and entrepreneurs as possible, both Spanish and international, and help them to boost their media exposure. The sign-up period is now open, and the activity has already secured commitments by well-known journalists in the field of entrepreneurship and innovation, including Mike Butcher, Editor-at-large of TechCrunch; and Robin Wauters, founder and editor of Tech.eu. Reimagine Food, the first centre specialising in food and technology, will hold the “demo day” for its Prometheus acceleration programme at 4YFN 2016. The event will also feature programming specialised in mHealth, in collaboration with the European Connected Health Alliance, which will present its initiatives illustrating mobile technology’s potential in the healthcare sector. For the third consecutive year 4YFN 2016 will also welcome the participants in the Imagine Express programme, a hackathon on a train that will travel from Barcelona to Paris to London, and back, from 19 to 22 February. Finally, it will host the “demo day” of the Startupbootcamp IoT & Data; the final of the EU Mobile Challenge, the European application competition; and also that of the Global Mobile Innovators Tournament, the first global competition for startups, backed by IBM and 4YFN. For the first time, the event will have a notable presence of French technology startups due to the cooperation with La French Tech. The institution, part of the French Ministry of Economy, Industry and Finance, is the main governmental programme dedicated to the international promotion of technology startups. Among all activities, La French Tech will celebrate a French Tech Hackathon contest, where French entrepreneurs will show their digital potential. Throughout the year, 4YFN’s team deploys a full spectrum of activities aimed at building tech startup communities. 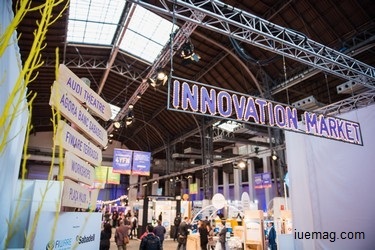 The highlight of the programme is 4YFN, held alongside Mobile World Congress, in partnership with the GSMA. This event has become the world’s most influential startup event devoted to innovation in the digital ecosystem. The next edition will take place on 22th-25th February 2016 in Barcelona. Mobile World Capital Barcelona is a shared vision and collective action to transform Barcelona into a mobile and digital hub and to improve people’s lives. With the strong support of the public and private sector throughout Barcelona, Catalonia and Spain, Mobile World Capital Barcelona focuses on changing the economy, education, healthcare and lifestyles through four programmes: Entrepreneurship and Innovation, mSchools, mHealth, and Smart Living. In addition to hosting the Mobile World Congress, MWCapital creates community platforms such as the Mobile World Centre and 4 Years From Now (4YFN), an event connecting startups. Any facts, figures or references stated here are made by the author & don't reflect the endorsement of iU at all times unless otherwise drafted by official staff at iU. This article was first published here on 19th December 2015.